There's a new threat to civilization, and this time it's something we can't see: the Nanostray virus, which is deadly enough to serve as an immediate threat to humanity as we know it. The solution? 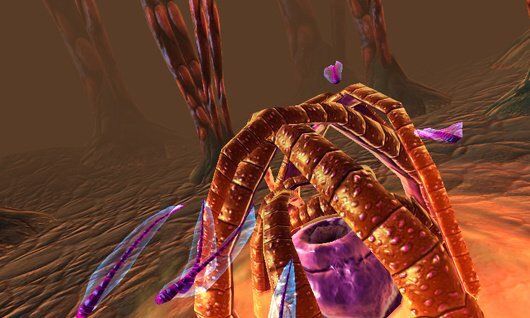 Well, as anyone who's seen Fantastic Voyage (or, erm...Innerspace) knows, it's time to shrink a spacecraft down to microscopic size and take out that virus ourselves! That's the plot to Nano Assault, and it fortunately doesn't get in the way of the game's action. In fact, apart from a respectably brief opening sequence, there's little said about it at all. The game wants to get us shrunk down and blasting baddies as quickly as possible, and we certainly won't complain about that. Of course, this isn't the first time that developer Shin'en have brought the microscopic virus to our attention: it originated in its Nintendo DS shoot 'em ups Nanostray and Nanostray 2. Each level takes place upon a single cell. The particular missions vary, but they're always some combination of collecting healthy DNA strands, clearing out small manifestations of virus, recapturing contaminated areas, exploring tunnels and fighting massive — well, relatively massive — bosses. You maneuver your ship with the Circle Pad and fire in any of four directions with the face buttons. L changes the spread of your shots and R fires your secondary weapons, once you've unlocked them. 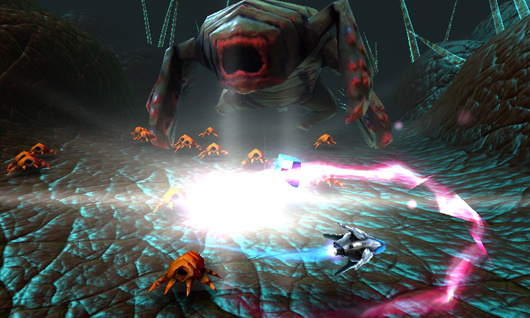 It won't take you long to be utterly dazzled by the sheer graphical scope of Nano Assault. Each individual cell is clearly distinct from any other, and they are each impressively rendered and beautifully detailed. In fact, everything about the game looks great. The screenshots don't do it justice; this is a game that has to be experienced to be appreciated, and it's clear that a huge deal of effort was put into making Nano Assault as graphically impressive as possible. In the same regard, the 3D effects are absolutely stunning. The depth of field is remarkable, and everything from level elements to boss attacks make great use of the console's 3D capabilities. 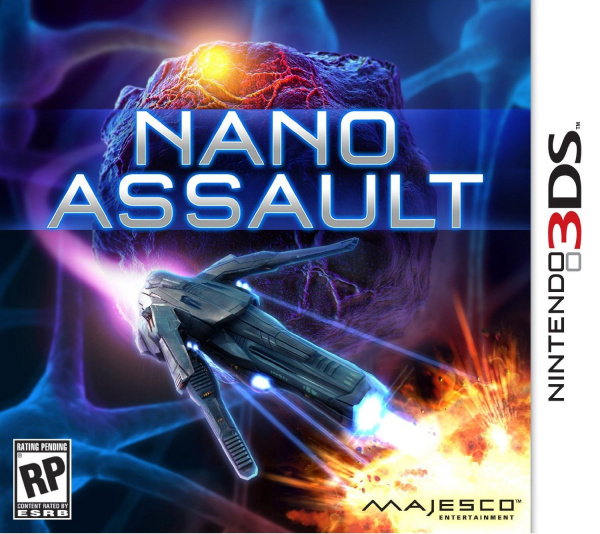 In fact, if you were looking for just one game to show off 3DS's graphical abilities, you wouldn't go wrong in choosing Nano Assault. The aforementioned tunnel sequences in particular rely on the 3D effect to help you dodge and weave your way through waves of enemy fire, and they're handled gorgeously. There are a few unfortunate instances of slowdown, but if anything they just serve to remind you that with the sheer volume of motion on the screen, it's a miracle there isn't much more of it. It's primarily played with an overhead perspective, and as you circle the small cells you'll find the entire structure rotating beneath you, Super Mario Galaxy style. 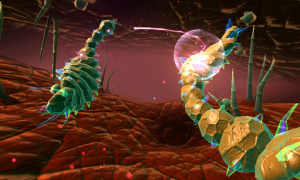 As you clear cells of infections you'll need to keep on your toes — this is one vicious virus, and you'll be bombarded with waves of enemies and projectiles from every angle. For this reason, Nano Assault is not for the faint of heart. You need to keep moving constantly, spraying the air with bullets in all directions. Apart from the often clever boss fights, there's no time to think, as the smallest hesitation will get you killed. This treacherousness is further compounded by the annoying tendency of enemies to spawn directly beneath your craft, resulting in an instant kill. That's a bit less fair a move than we'd hoped to expect, but, again, if you keep moving it shouldn't result in more than the periodic annoyance. It's still a questionable programming choice, though. The tunnel sequences are where the game really shines. 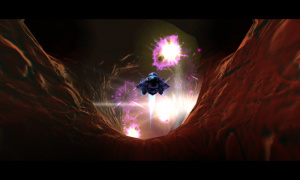 As your ship is sent off to explore unknown areas, the perspective changes to a behind-the-ship view, with only straight ahead firing possible. As your ship drifts and drops through networks of cellular corridors, it's up to you to guide it past obstacles and gun down the enemies that appear along the way. These sequences are always innovatively crafted, with smooth difficult curves and inventively cruel enemy placements. It's likely that these levels will take several passes to master, but once you do make it through alive, the feeling you'll get is one of pure satisfaction. Nano Assault is, make no mistake, an extremely difficult game. One hit kills and relentless waves of enemy projectiles all but ensure that you won't conquer this viral invasion easily. That's part of the appeal, though; while Nano Assault is always a challenge, it almost never feels unfair. It's an addictive experience with some of the most satisfying battles we've had on the console yet, and for fans of the genre, it's far from a misfire. Completed levels can also be replayed with additional challenges to complete (such as succeeding without dying — which is never easy! ), with high scores uploadable to online leaderboards. 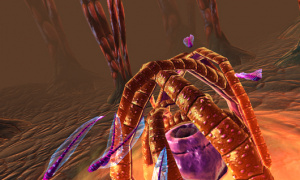 Nano Assault is a gorgeous trip through the beautifully-rendered worlds of the human bloodstream. It's both punishingly difficult and endlessly satisfying, and it does an excellent job of keeping the action varied and the tensions high. The difficulty is bound to infuriate some potential customers, but the levels are fairly brief and can eventually be mastered. Apart from some small issues with slowdown and the frustrating tendency of enemies to spawn directly beneath you, Nano Assault is an easy recommendation for shmup fans, or anyone who really wants to see what their 3DS can do. Looks nice.... But it's not on my top wanted games..
Why is it not coming to EU? I want it !!! Really want this one (I have the previous Nanostrays), but have yet to find in the shops over here. Hope for a EU release soon. Want this. Look like tons of fun. Hopefully there'll be a Europe release. Saw this on the US Amazon store last month going for around £8, I think I'll wait for it to come down in price before making a purchase. i want this title eventually. always up for some sweet graphics to see my hardware in action. but certainly not at the current retail price. ill wait for a used copy or a bargain deal. just like Steeldiver, its fun to play, but doesnt feel like a full retail game. maybe im wrong with this one, but it wont change my mind. with kid icarus coming soon, tales of the abyss that i must own before copies get too rare and a bunch of ps3 titles coming, there is just no more room in my budget for nano assault. Week one purchase should it come to Europe. I really enjoyed Nano Assault, but there will always be a part of me that longs for a new Nano Stray game on 3DS. Great review Phil! This is supposed to be released in Europe at some point but 505 Games haven't announced the release dare then. I will definitely get it whenever it does come out! Warning! this game freezes when submitting scores online. I like difficult games, I may get this eventually. I agree that some of the sequences are graphically impressive... but has anyone noticed more ghosting than in other games? It's bothered me here more than in any other 3DS game, and takes me out of the experience. I like the game, but haven't been as excited about it as I'd hoped. Only a couple of hours in; maybe it'll get its hooks into me yet. Is this similar to superstar dust delta on the vita? I wish I were good enough to play something like this. Alas, in the first Nanostray game I couldn't even make it through the first level.. This game is absolutely stunning! I'm loving it! I hope this gets an EU release at some point, it looks like a great game. Fantastic review and fantastic game. Just beat it over the weekend and I would give it an 8/10 as well. I have no problem with this game other than the fact that there is no option to invert the y-axis. Either the option doesn't exist, or I can't find it. Or it's right in front of me and I'm missing it. Wow, you guys are a bit late with the review on this game. I bought this game on a whim back in December, but I certainly wasn't disappointed. Awesome fun game! Beautifully textured graphics. The controls are a bit quirky, but it's not hard getting used to. This game will probably get overlooked due to it's bargain bin price at the 'under $20' range. Generally, games selling at that price aren't that good and, most of the time, they aren't even worth that price. Nano Assault is genuinely a great game for a great bargain. Nice review, btw. I might get this game, If I find it in a store. I got this as soon as it came out and I can honestly say that it is one of the best shoot 'em up games I've ever played. The gameplay is spot on, the graphics are awesome and the music, with its upbeat hard-hitting tracks (make sure you connect your 3DS to powerful external speakers for the ultimate experience) combined with the frantic action on the screen keeps your adrenals throbbing. What's more, it never gets old, no matter how many times I play through the campaign. Nice review and nice score! I might pick it up when it hits Europe! By the way: I didn't know that the first 2 games also took place inside the human body. fantastic game...its biggest thrill is beating a hard level. Its one of those games that you hold a grudge because you can't beat the level, refuse to stop playing until you beat the level, then when you beat the level, you feel so happy, you keep playing. Then that scenario repeats over and over. Sad this has been out forever and yet people are just realizing it now. It was only $20.00 for me and that was three months ago. Well worth it. Awesome game, I am glad I bought it. Good review BTW. I'll have to give this game a try. Got this today at GameStop for $12!! This game is GEORGEOUS, extremely nice visuals, stunning really. I made it through the first 3 levels where you are flying around on a cell then made it to level 4 where you are flying down a tunnel, made it pretty far but then got waxed a couple times in a row by errant enemy fire. Although I like the occasional shooter, they are not my fav genre, but I am a fan of R-Type (Delta specifically). So I waited 'till the price was low because shooters are either challenging but fun or insanely punishingly pointless. So far this classifies as one that I want to try to play through. yay! Seems like a steal for 12$ to me. More people need to own this game. It's a ton of fun.